My husband and I bought our house just about nine years ago now. I was 22 and he was newly 23 when we snatched up "the smallest lot in our sought after neighborhood," which was the house hunting pro-tip everyone sent us out into the real world with. We knew the area we wanted to buy in, knew the schools we wanted our future children to attend -- and we also knew we were fresh out of school with virtually no real life experience or resumes that could be considered remotely impressive (see also: we had no idea how to be adults). But then our there our house was, the fabled smallest lot in our sought after neighborhood. There it was, with it's disastrous roof and foreclosure chic interior. It became ours and each evening we reveled in it's vastness. Our home. A real house in the suburbs, in a neighborhood where the laughter of children permeates through the afternoon air. We decorated our home the only way we knew how: by buying real furniture from real furniture stores that was meant for big, gigantic houses and not the compact apartment spaces we were used to during our college years. We were married the following year and, two short years after that, brought home Ethan to this very house. It's funny how the addition of an eight pound, four ounce infant shows you a thing or two about perceived home sizes. Our "just big enough" home quickly showed us just, in fact, how small it really was. 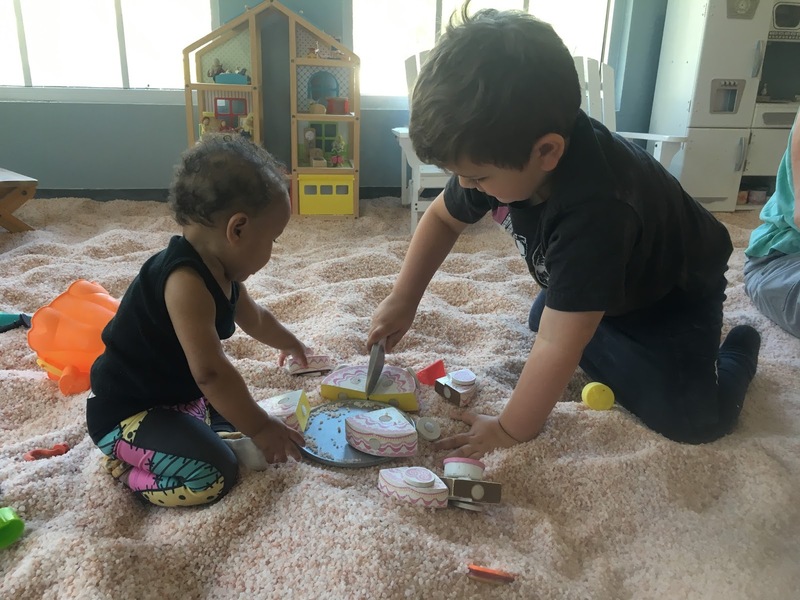 With small babies come big things, and with toddlers come big messes, and with preschoolers come even bigger things that make even bigger messes. (And with cats who have claws comes the inability to ever have nice things regardless so, you know.) When Wylie died and my will to live plummeted, I put everything I had into a proposed house revamp. 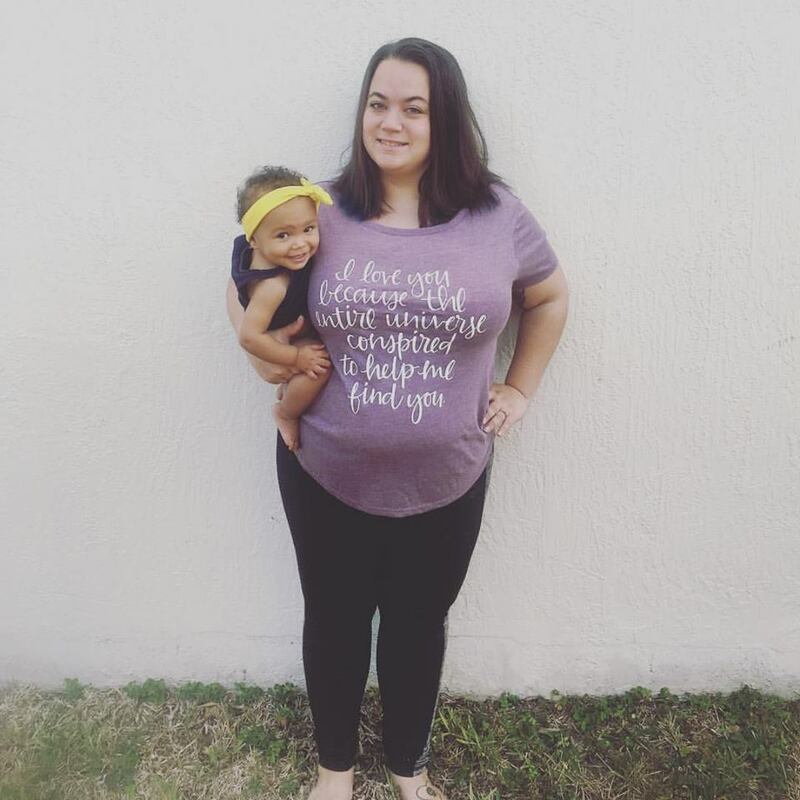 I needed something to focus on that wasn't infertility, that wasn't injections into my stomach or physicians scraping my insides out and spewing statistics at me about the chances I have to add another urn to my shelf. I didn't get very far, short of some paint swatches here and there and just slightly taking apart the kitchen. 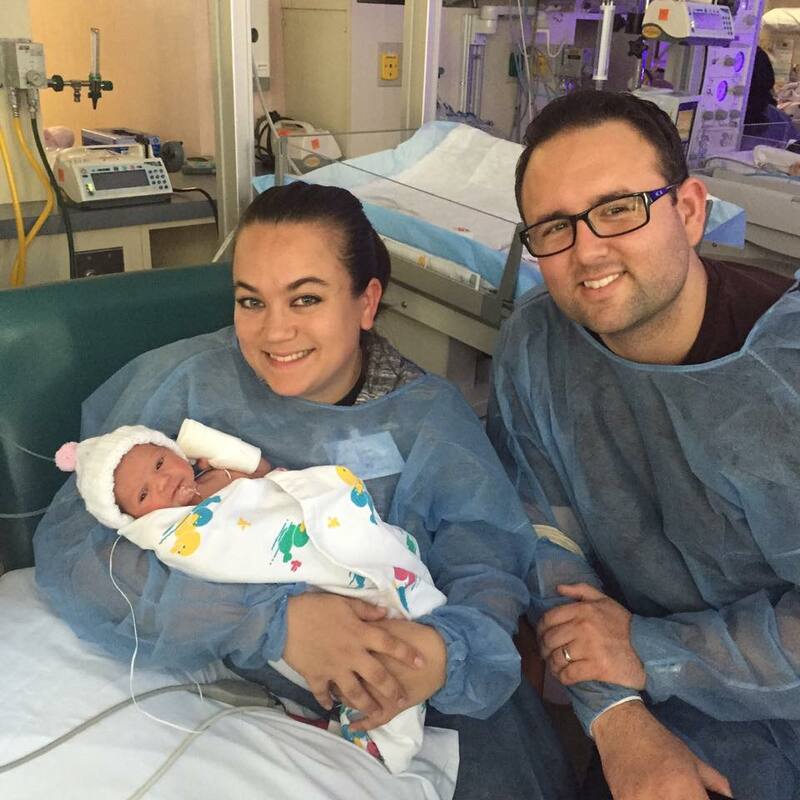 Carmen joined us and my desire to redo and rebuild was replaced by my desire to mother this incredible, radiant addition to our family. With gratitude and fullness and completion comes the desire to nest, and I decided on a whim that now it was time to make this house a home. I trashed our entirely-too-big sectional this weekend and replaced it with small, compact couches. With Ethan in school and Carmen napping, I took everything off the wall and out of the closets and am knee-deep in some purge-and-rearrange obsession (which currently makes it impossible to stand in my dining room) because I totally didn't have enough on my plate already, or something. We are ordering new window treatments and curtains and throw pillows and sell and swap and repeat. I can remember signing those papers to make this house ours. I can remember coming home from our honeymoon and crashing on the entirely-too-big sectional. 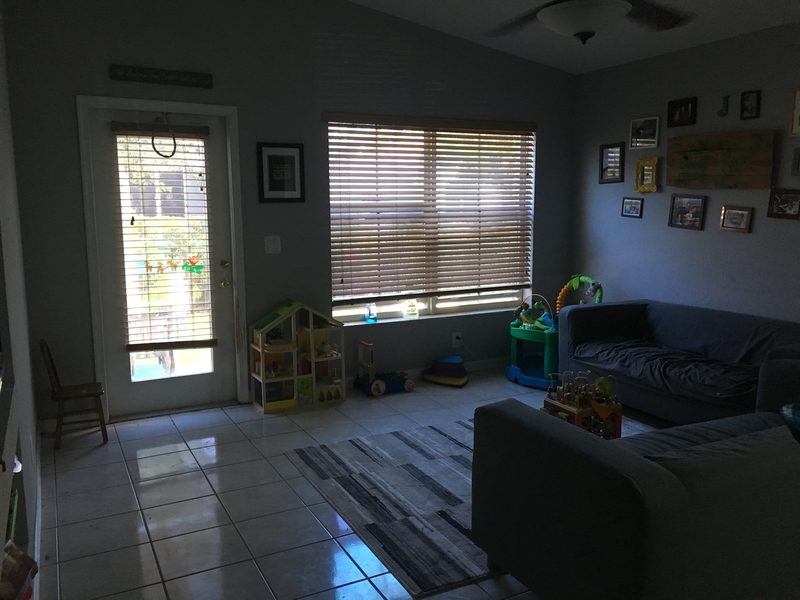 I can remember ordering our entirely-too-big dining room table with the bench seating for the four children I just knew we would have, plus room for their friends. But by now, we've gotten a hang of this adult thing, for the most part. We will never have four children and with that mourning comes the acceptance, the feeling of wholeness (or as close to it as possible) of knowing that the dynamic duo I have ransacking my clean floors have completed us in a different way than originally planned -- but completed us nonetheless. Next, I will say goodbye to the entirely-too-big table with the entirely-too-much bench seating and as I watch things make their way to new homes, new hopeful families, new destinations, I am finding solace in my own. We have the house. We have the family. And now it's simply time to make it a home. 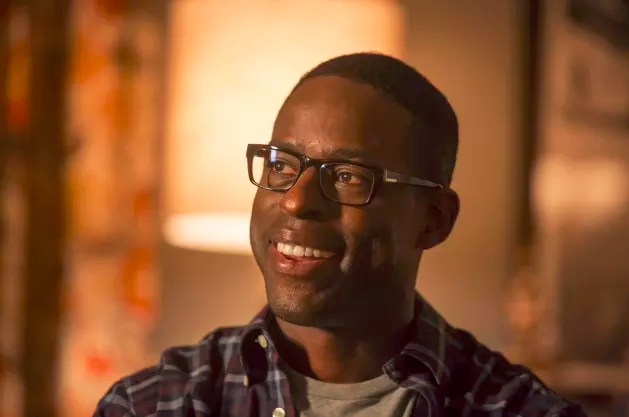 Like just about everyone else, I'm completely hooked on This Is Us. I think it's the first show that my husband and I have actually watched together since Queer as Folk was still on the air. Like, when we were in high school. It's just a good show, for starters, and then there's that whole infant loss-transracial adoption thing that ties eerily close into our own lives. In the short time I've been an adoptive parent, I've been perplexed by some of the attitudes towards adoption from the outside world, most of which are portrayed on the show. There's that whole pesky white savior thing, which is another issue for another time. And then there's this expectation of gratitude from the adoptee at all times. "And all I was supposed to feel was grateful." I hear that a lot, people who baby-talk at Carmen and ask into her smiling face, "do you know how lucky you are? You should be so thankful." But, to my sweet, strong daughter, I just want to say that I reject this expectation of gratitude. I tear it up and set it on fire and dispose of it with haste. My love, I want you to breathe fire. I want you to make your voice heard and move mountains and know the power and validity of dissent. I want you to soar and break barriers and shatter glass ceilings. I want you to be every bit as spunky, headstrong and determined at fifteen as you are now, at ten months old. A few days ago at the beach, you tried to crawl into the ocean, intrigued by the vastness of the sea and the way the wind whipped the saltwater from the waves. You wanted to explore it, all of it, not once being fearful of the unfamiliarity or the spray of salty water onto your face. I want you to always be that way, always so eager to learn and grow and understand things instead of fearful of their newness. I want you to be thirteen and angry with me, as I so often was with my mother, for a parenting decision that you can't understand at the time but later will. I want you to be upset when I tell you no at the store. I want you to meet your disappointments with tears and all of the feelings that I expect, encourage and nurture in a child like your brother who was born from my own body. Feel the world, sweet girl. See color and feel it, all of it, deep inside your bones. Rise against the oppression and those who pass laws and build barriers against you. Feel angry at injustice and feel saddened by things you cannot control. Feel everything and anything you must, my love, with the exception of gratitude towards me. You owe me nothing in life, but there is so much that I owe you. Do not thank me for something as basic as loving you, for something like signing a legal document that gives you my last name. How is someone supposed to be thanked for something as normal as breathing, thanked for being human? Of course I loved you. Who couldn't love you? Who couldn't see the difference that your eyes and heart and smile make in the world? 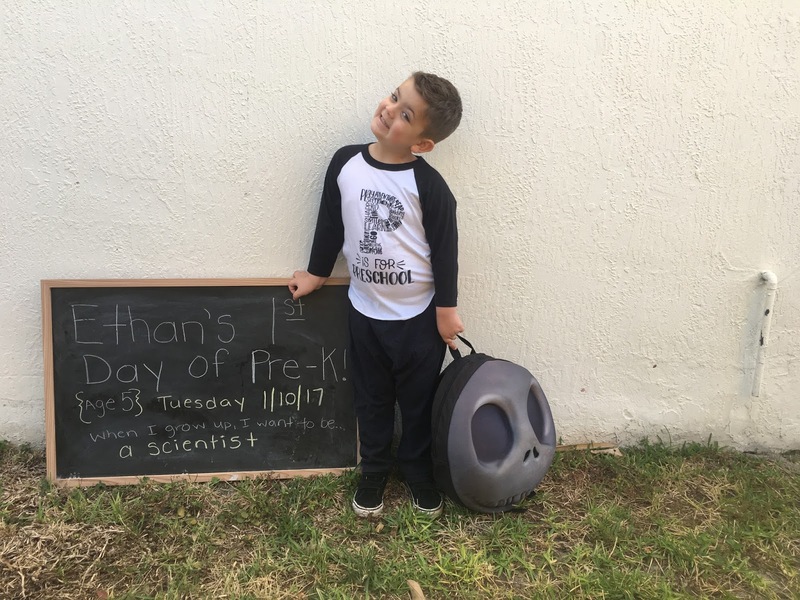 Today was Ethan's second first day of school. He did a brief two week stint last fall at a school that I carefully selected yet became very obvious (very quickly) that it was a horrible fit for him in actuality. From the moment I first dropped him off at his last school, I sat with tears in my eyes and a pit in my stomach until the moment I could retrieve him. He would return home rattled with tales of yelling and classroom free-for-alls that made my stomach drop (my best friend took my anxiety down a notch by telling me to imagine Ethan as Jim from The Office, looking into the camera while these antics happened around him). I did not have the same dread when we toured this new school, which happens to be a smaller Montessori even closer to our home. Selfishly, I am not ready to say goodbye to my at-home time with Ethan. I have spent the past five years growing accustomed to ten a.m. park playdates or midweek zoo trips. Five years is a long time to suddenly have to pull away from the only way of life you truly know. Of course, time changes things and children grow older (yes, I'm singing Landslide in my head, too). Ethan has been bored at our ten a.m. park playdates as the only options for playmates are two year olds who are not yet enrolled in school. He wanted so badly to be part of a classroom and a school environment again and I just keep telling myself that my plan was always to follow his lead. When he was not ready for school, I happily warded off the nosy strangers wondering why my four year old was at home with me still. When he decided he was ready, my plan was to let him soar with the greatness I know he is capable of. I've always believed that following his lead is the best thing I can possibly do for him -- even if letting go and stepping into the next stage of life hurts my heart. I teared up just a little bit as I walked to my car this morning, asking Carmen what in the world we should do until it's time to pick up her brother. But the strangest thing happened at drop off today, too: it felt okay. The pit in my stomach was not there, no matter how hard I tried to seek it out. I did not have that maternal urge to fling myself over him to protect him from the (non-existent) yelling. Instead, I dropped him off into a beautiful Montessori classroom where love, kindness and warmth permeated through the air. He was immediately greeted by his kind teacher and escorted to an activity by a sweet classmate. "Okay, you can say bye now," Ethan said without looking up from the activity he and his new classmate were doing together. They were about to begin morning yoga. And then I felt it: the peace. This fit was perfect. This school felt made for Ethan, and made for our family, and nothing seemed as catastrophic as it did a few months ago. Once we dropped Ethan off, Carmen and I went to the park. Sitting there enjoying the nice breeze with Carmen as she worked on pulling up on the equipment bars and trying to stand unassisted, I realized again just how fast it all goes. It feels like yesterday Ethan and I had years left of our free, meandering days. I know that right now it feels like Carmen and I have all of the time in the world for this freedom and stage of life, but now I know that's not true at all. I will blink and she will be starting school and it'll be an entirely different phase of life for us to navigate. Not bad, of course, but different. I like to think that I cherished every second of Ethan's time at home with me but I will make it my mission to be sure I never, ever take a moment of Carmen's time at home for granted. During one of Carmen's check-ups, a woman pushed her flu-positive child into the elevator with us and argued with me that kids get sick. Deal with it. 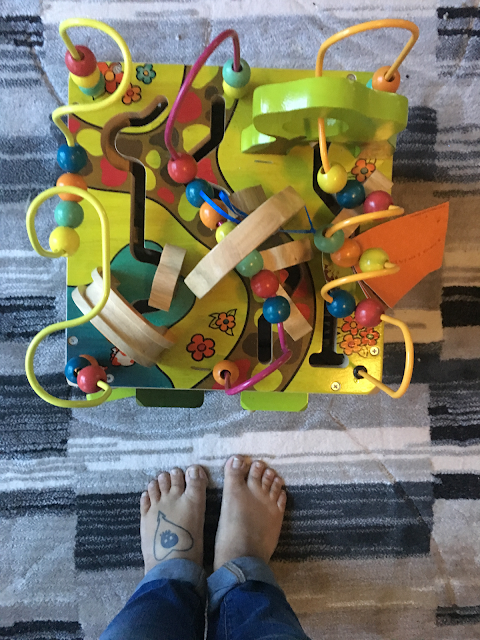 I clutched my healthy underweight preemie baby in my arms as if I could shield her from the sneezing, hacking, whining mess of four year old standing dangerously close to us. As Ethan has a history of respiratory issues and asthma, I'm tired of having that argument. I'm tired of the "kids get sick" nonsense because some kids really get sick and nobody deserves to have to comfort their small child in an emergency room bed just because someone thought it was cool to share a little croup or maybe a little strep throat like it's some childhood rite of passage or something. Sometimes the argument morphs into a debate about healthcare in America and missing work and missing school and I'm not even touching any of that, just saying that maybe if your kid has a random fever of 102 degrees and two days worth of diarrhea, it's okay to skip a day of mommy and me class. If your kid needs an emergency barf bag, they probably would feel better at home on the couch vegging in front of TV rather than swinging on the playground -- even if it means you miss your run for the second day in a row (I'm looking at you, lady in neon green leggings at the North Community Park playground). The other day, my friend even texted me that a mother brought her sick child into the healthy child's classroom -- holding a puke bucket and all. Please, people. No one wants your vomit. Sharing isn't always caring. We are in that phase of illness where there is some residual coughing at nighttime. 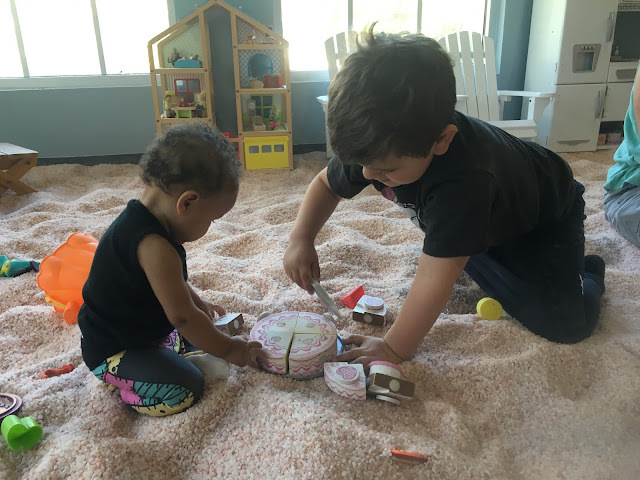 We are no longer contagious but cautious about what other illnesses are looming in the places that won't kill us to take a week off from, like mommy and me classes or public playgrounds or museums. Yesterday we strolled downtown near the ocean for hours, smelling the sea breeze and watching the sailboats go by on the Intracoastal. Today we did a salt therapy session which cleared up Carmen's breathing so quickly, she was able to finally get the first decent nap in some time. As I praise the power of medicine and submerge myself in gratitude that my kids seem to finally be on the mend, I'm finding myself a little apprehensive about school starting. School. Isn't that the place where people say your children really start to bring home the germs? Yesterday I stocked up on saline spray and Boogie Wipes and today I signed up for a pass at The Salt Box because something tells me we're going to need it. Other than a healthy, well-rounded diet (which my children get and I could probably do better at considering Starbucks won't protect me from the gunk Ethan will bring home), are there any secrets for staying healthy and building immunity? I think I would do just about anything at this point to prevent another week stuck at home itching from the germs permeating through the house. Yesterday we went to Legoland and today the kids woke up sick because, my gosh, we just have the worst luck this time of year. Ethan left the doctor this morning with a diagnosis of strep throat and Carmen left with a double ear infection and pneumonia. I usually feel my skin crawl when the kids are sick because it means germs, and it means being stuck inside for days on end, and it means everyone is crabby and miserable and just wanting to be out in the world. This time, I feel calmer and less frustrated by being homebound while the antibiotics do their thing (the pneumonia thing, though, has me pretty on edge). School is back in session next Monday and while this has been information I've never needed as the parent to a child who isn't in school, now I do. Ethan goes back to school on Tuesday. I haven't let my mind really absorb this information. 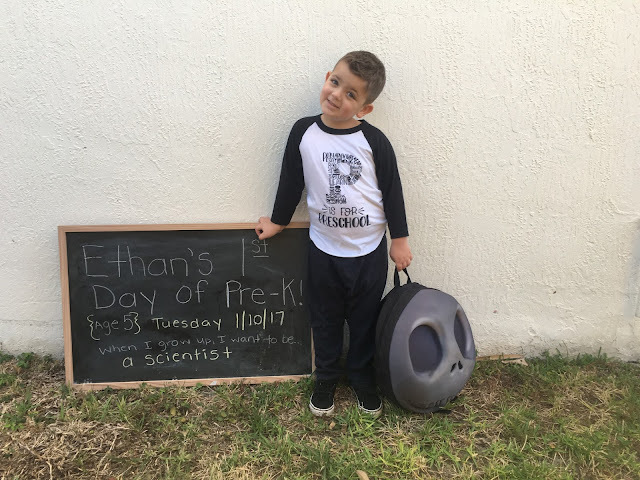 I'm nervous for this new start, but Ethan is excited. I'm selfishly going to miss the groove of our mornings at home, snuggled up with no place to be. Ethan was temporarily in Pre-K for a (very) short time before I pulled him out after a couple of weeks due to the school not being the right fit. We've re-enrolled him at a small Montessori school instead. Three mornings a week, just to get used to Kindergarten next year. Three mornings a week of backpacks and walking him to a classroom and saying goodbye. I'm not good at goodbye. As a mom who has lost a child, I'm always in the minority in the loss community when it comes to associating growing up with feelings of heartbreak. I am grateful beyond measure to watch my children grow, but, oh. The ends of each era hurt as much as they fill me with pride. One day things will be different than they have been, and that one day is closer than I know what to do with. Each phase will be beautiful, sure, but right now I'm not ready to say goodbye to the way things are now. 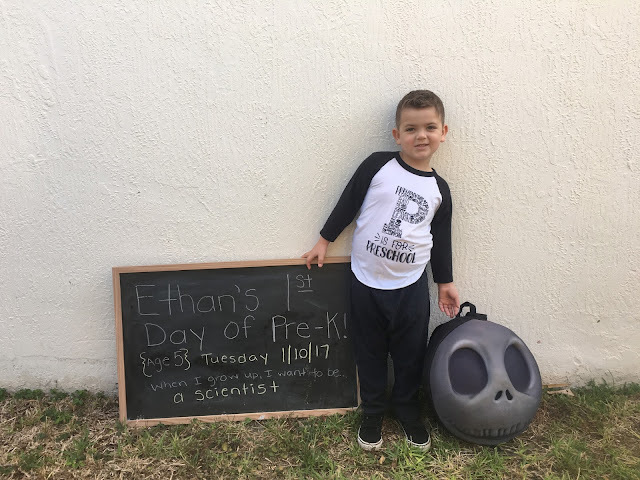 Ethan is excited and I am trying to channel some of that excitement, chasing it down with the reassurance that I was correct to follow his lead and wait until he was ready regardless of when the state declared him to be ready because of his birthday. But today, all week, I have these two incredible babies in love with the world and one another. All week, I have every single morning devoted to them and nothing else, nowhere to be; just recovering from illness and lounging around the house in our pajamas. I'm determined to enjoy it all, even the crabby moments. Even the feverish ones and the 3 a.m. wake-ups and the snot and the albuterol treatments and the requests for food that no longer sounds appealing once it's been made.